Success in Lean transformation is contingent on engagement at all levels within the organisation. Real change requires winning the hearts and minds of the workforce. Getting this right at the outset demands serious consideration. Workplaces won’t improve themselves. Evidence confirms transformation is all about our people – and our people are our only appreciating asset. The power of engaged people is amazing – what it can do for our organisations, processes, bottom lines and shareholders. Yet, after visiting businesses of varying sizes, in differing sectors across Ireland, very few people are jumping out of bed in the morning inspired and excited to start another day at their workplace. Instead, we often hear clients speak about the struggle, frustration, pain, recurring problems, inter-departmental rivalries and stress. This happens until their workday ends and they can go home, coming back to do it all over again tomorrow and many tomorrows, for the rest of their careers. The opportunity this presents is enormous. As we introduce Lean thinking and approaches, we must emphasise the positive messages of creating better workplaces, developing our people, their knowledge and skillsets, improving capability, eliminating frustration and stress. We must move people away from the misconception of “Lean & Mean” and shout the message of empowering people to take control of and take pride in their work. We need to challenge and support the workforce to make work easier, eliminating recurring sources of frustration. We need to interest our people in embracing and becoming good at problem solving and experiencing the satisfaction and fulfillment that change and continuous improvement can bring. To accomplish this we must give our people strong vivid descriptors of what the future can bring and the fulfilling part they can play in that journey. We can share the messages we hear from others who are making progress on their own journey. When you listen to organisations that are making this progress you’ll hear things are “calmer”, “less frustrating”, “easier”, “transformed”, “flowing”, “cleaner, brighter and organised”; “the work moves faster, not the people” and most importantly, “I’m really listened to and supported”. 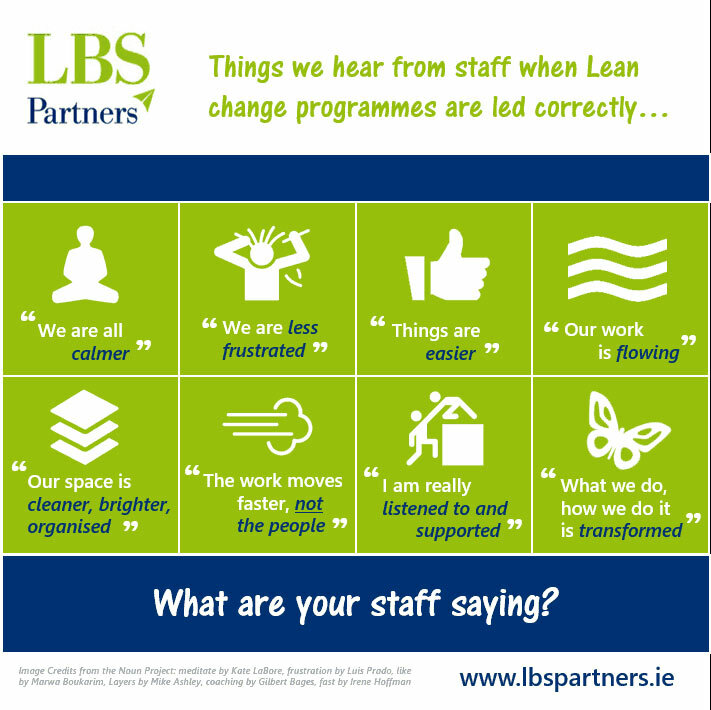 As we use Lean methods to lead change, we need to be crystal clear in our heads about these positive messages and also set expectations about the journey ahead and the first steps on the road to continuous improvement.